I kicked of the festive period earlier today with December's edition of No Croutons Required. We have a tradition that December's No Croutons Required is a photography event and festive photos are what we are looking for. Whatever that means to you. I do hope you will all join in. But now, I would like to give something to you! 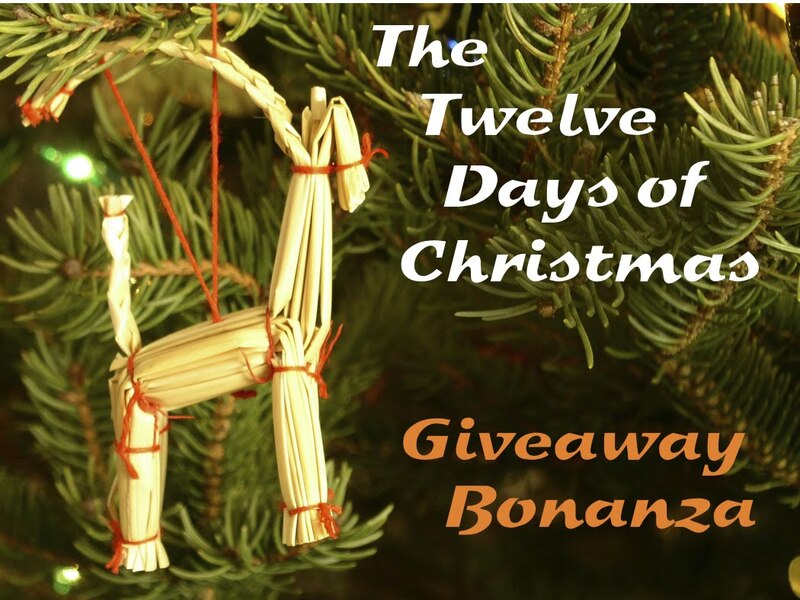 So for the first 12 days of December, I will be hosting a giveaway each day and the winners will be announced over the 12 Days of Christmas. Zak from Prezzybox, a rather fabulous online gift shop, where you could easily do a big chunk of your Christmas shopping in one go, has provided us with our first Christmas gift. A gorgeous chocolate Orange Pizza. Chocolate Pizza - Ultimately Orange - 10"
The Chocolate Pizza - Ultimately Orange - 10" is the perfect gift for chocoholics everywhere! Why settle for a traditional savoury pizza when you can enjoy the sweet and scrumptious taste of a chocolate pizza. Delivered in a takeaway style box and cut into eight slices it is just like its savoury twin but deliciously sweet. If you love chocolate and orange then this is the chocolate pizza for you! 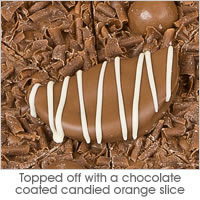 The Chocolate Pizza - Ultimately Orange - 10" is a yummy Belgian milk chocolate base with natural mandarin oil. It is topped with orange rainbow drops, white honeycomb balls and milk chocolate curls. It is finished with chocolate covered candied orange slice. If you would like a pizza delivery of the chocolate kind, for yourself or a friend, then enter the giveaway. 1. Leave a comment to say you would like to win a pizza. 4. Follow @Prezzybox on twitter and leave a separate comment to let me know you have done so. 5. Tweet the competition using (Win an Ultimate Orange Chocolate Pizza from @Prezzybox in the 12 Days Of Christmas Giveaway at Tinned Tomatoes http://tinyurl.com/d3z2yrg) and leave a separate comment to say you have done so. 6. Like the Prezzybox Facebook Page and leave a separate comment to let me know you have done so. 7. Like the Tinned Tomatoes Facebook Page and leave a separate comment to let me know you have done so. The giveaway runs until the 24th of December 2011 and the winner will be announced on Christmas Day. This competition is UK only. A big thank you to Prezzybox and good luck to everyone who enters. I love the chocolate orange combination and always look forward to the spherical delight at the bottom of my stocking!!! Even better is hubs doesn't like chocolate orange so I don't have to share! Yeah!! Wow....what a lovely idea...a chocolate pizza, brilliant. I would love to win it....nom, nom, nom!! I would LOVE to win the pizza Jac! Nom nom! I am now following @Prezzybox on twitter! I have liked prezzybox FB page! Yummy yummy yummy! I would love to win a chocolate pizza! Why has no one ever come up with this idea before! Following @prezzybox on Twitter now as well! Have tweeted about the competition. Last but defintely not least I have liked the Tinned Tomatoes Facebook page! Hope I've done everything right! I just realised on of my comments says I "Kiled the Prezzybox FB page" I didn't mean to kill them I'm sorry! It's meant to say "Liked" me and my over-excited typing! Doh! I would LOVE to win this pizza!!! I love chocolate and orange so I'd love to win this. I follow Prezzybox on Twitter. 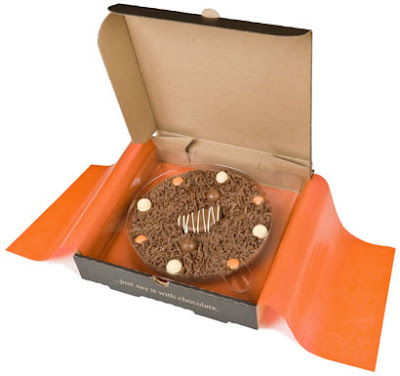 If I won this chocolate pizza I would gift it to my MIL who loves chocolate orange. I very much 'LIKE' the Tinned Tomatoes FB page. Hello! Great giveaway, chocolate and pizza are basically my other half's two favourite things so this would make an awesome present! And I also follow you on twitter! I would love to win this for Mr. B. - its his idea of heaven. I would LOVE to win a chocolate pizza! What an amazing pizza - I would so love to win! I really like to win a pizza. Chocolate Orange is just lovely and this looks so nice. Following you on google connect as M.
I have liked the Prezzybox FB page. I have liked the Tinned Tomatoes FB page. I would like to win a pizza. Great prize - Mr CC would faint if I presented him with this! I think my mum would actually kill for this if she sees it! Would love to win for her. I would love to win the choc Pizza! I would be very grateful to win this prize. Oh my gosh. My dad LOVES orange chocolate. This would make an awesome gift!! Oh my! How yummy! Can I have one?! I have followed you through GFC and networked blogs.